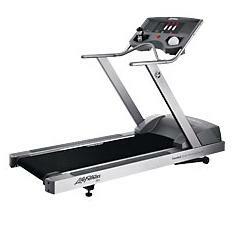 The Life Fitness 90T treadmill is the most basic commercial treadmill from Life Fitness. And as expected it is also the company’s cheapest commercial model. If you’re a start-up health club owner who’s a little tight on the budget, then this machine is perfect for you. It is not as costly as other Life Fitness commercial treadmills which would allow you to save money for more important aspects of your business. This treadmill comes with a 3.0 HP continuous DC motor that is capable of up to 10mph and 15% incline. These speed and elevation would be enough to give most (beginners and intermediate runners) of your users an intense workout. The 3-numeric display windows (10 characters total) shows your users their Elapsed Time, Speed, Distance, Incline, Calories, Heart Rate, and Distance Climbed so they’ll always know all important information regarding their exercise. Other features include a reading rack to place magazines, an accessory tray to hold sports bottles, Tubular steel ergo bar to keep users balanced, and a Polar® Telemetry (chest strap required) to allow your members to workout in their target heart rate zone. To conclude, I would recommend the Life Fitness 90T treadmill if you want a basic Life Fitness commercial model. But I also suggest you check out other commercial brands (Landice, Precor, or Woodway) before you decide to buy. There are other treadmills out there that would give you more value for your money. If you plan on buying a Life Fitness 90T treadmill, I suggest you buy it at Amazon.